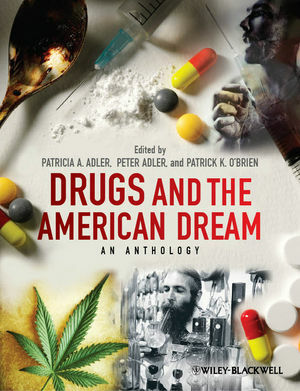 Drugs and the American Dream presents an up-to-date anthology of chiefly contemporary readings that explore the myriad sociological correlates of licit and illicit drug use in the United States. Unique approach to the topic that offers an organizing theme of sociological concepts-age, social class, ethnicity, gender, as well as societal response to drug use including drug education, treatment, and policy. The book is interdisciplinary in terms of approach, making it useful in a variety of contexts. Brief framing introductions to each article provide ""interconnective tissue,"" guiding the student to the heart of what's important in the piece that follows. Offers a balanced approach to various substances-tobacco, alcohol, prescription drugs, and illegal drugs. Provides students with a realistic perspective on the extent of substance use in American society as well as a critical appreciation of the real versus imagined harms associated with use of various substances. Patricia A. Adler is Professor of Sociology at the University of Colorado, Boulder. Her areas of interest are deviant behavior, social psychology, and qualitative methods. Her classic book, Wheeling and Dealing (1993), was one of the first explorations of upper-level drug dealers and smugglers. Peter Adler is Professor of Sociology at the University of Denver. His areas of interest are sociology of drugs, sociology of sport, and symbolic interactionism. Along with Patricia, he has written many books, including Backboards & Blackboards (1991), Peer Power (1998), Paradise Laborers (2004), and The Tender Cut (2011). Together, the Adlers were honored with the 2010 George Herbert Mead Award for Lifetime Achievement by the Society for the Study of Symbolic Interaction. Patrick K. O'Brien is a doctoral candidatein Sociology at the University of Colorado, Boulder. In 2010, O'Brien won the Outstanding Graduate Student Paper from the Drinking and Drugs Division of the Society for the Study of Social Problems.